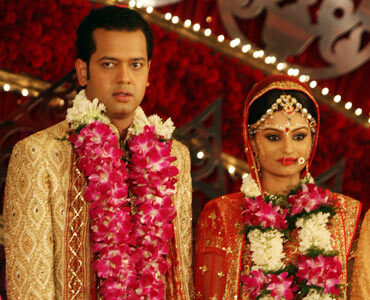 Rediff.com » Movies » Rahul Mahajan, Dimpy to divorce? Rahul Mahajan, Dimpy to divorce? Celebrity couple Rahul Mahajan and his wife Dimpy Ganguly seems to be heading for a split after Dimpy walked out of Rahul's home alleging abuse. In an interview to Mumbai based tabloid, Mumbai Mirror, Dimpy alleged that Rahul beat her up regularly and also pointed a gun to her head in one of their fights. Dimpy left Rahul's home after a brawl with him on Thursday morning. Rahul's secretary however denied the allegations. "Our lawyers will send a legal notice to dimpy regarding this," he said. Rahul met Dimpy on a reality show, Rahul Dulhaniya Le Jayega after which they got married in March 2010. At that time, Rahul told rediff.com, "This wedding is a second birth for me." Rahul was earlier married to his long time girlfriend Shweta Singh who divorced him in August 2008 alleging that he beat her. When asked why he chose Dimpy out of 16,500 applicants, Rahul said, "From day one itself, Dimpy and I were very comfortable with each other. We are good friends now. I have always believed that a good friend will make a good wife, and that is what I saw in Dimpy. I can talk to her about everything. I don't have to be careful about my words or the way I talk. She is only 21 but is really matured for her age. She is always smiling. I love her for that." However in four months the marriage seems to be cracking. The first signs were visible last week when Rahul started sending sms to actress Payal Rohatgi who was his house mate on the reality show Bigg Boss. Payal in an interview to a tabloid said that she did not wish to be in touch with Rahul because he was already married. We tried contacting Rahul on his cellphone, but our calls went unanswered. Dimpy's cellphone on the other hand was switched off.